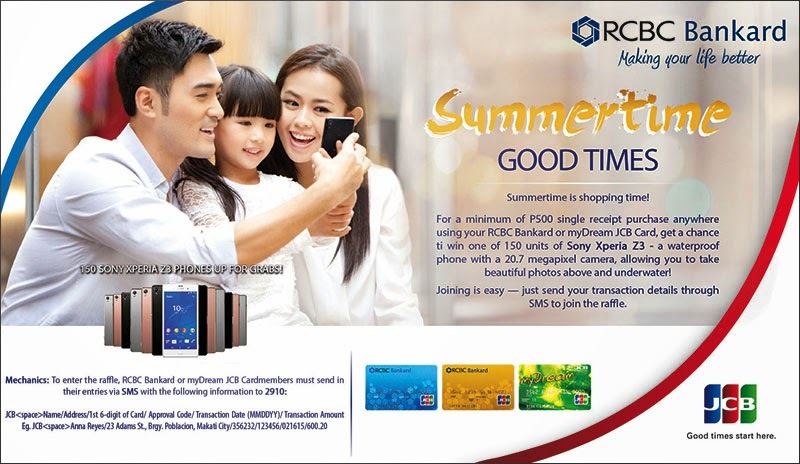 JCB Summertime Good Times ~ Philippine Freebies, Promos, Contests and MORE! If you love shopping using your JCB card, now is the time to swipe and spend for a chance to win a spanking gadget in the Summer Good Times promo. For a minimum single receipt worth P500, you will be entitled to one (1) raffle entry. All you have to do is text JCB[space]Name/Address/1st 6-digit of Card/Approval Code/Transaction Date(MMDDYY)/Transaction Amount) to 2910. P1 per SMS rate apply. Wait for a confirmation text if you keyed in the correct syntax or not. You may submit as many entries as you can provided that each entry must be from a different transaction. Shop and get those entries flowing for more chances of winning a brand new Sony Xperia Z3 - a waterproof phone with a 20.7 megapixel camera.